I’m a bit surprised at the relative ambivalence around Ant-Man’s “poor” performance in its opening weekend. Apparently, there are two ways of looking at things. While a good number of folks are celebrating the magnificent small achievement the flick is, a bunch of outlets — particularly in the movie biz — are having trouble managing their expectations. I’m here to take a stand for the first way of looking at things. Here are twelve things I loved about Ant-Man. Ant-Man! 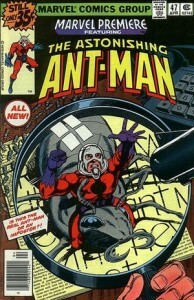 Have to start with the fact that I have always loved the idea of Ant-Man! Seriously, there are some concepts so basic and appealing that they have to exist. Super strength. Flying. Shape changing. Shrinking. Embiggeness. The rule of cool prevails with Ant-Man. Talking to insects is a bonus. The Plot! Based upon the classic Ant-Man stories in Marvel Premier 47 and 48 (1979, with amazing art by George Perez), the plot is a self-contained wonder of story-telling. The film goes beyond it somewhat, but is firmly anchored in this very solid source material. Tedious Origin Story is NOT Tedious. Maybe one of the only things I was dreading about this was the typical Origin Story that has become an albatross for superhero films. Ant-Man does have its origin bit, but because of the particular elements of Lang’s story and the interactions between Rudd and his jovial criminal conspirators. (Michael Pena! Amiright?!?) No lingering here. Great pace throughout. Tedious Training Montage is NOT Tedious. Paul Rudd and Evangeline Lilly turn an old trope into a great sequence of bits. Aside from the writing, their chemistry is great throughout. Great set pieces. Thomas the Tank Engine? The ant dog? The heist at Pym’s house? The suitcase fight? That’s what I’m talking about. Sidelining Hank Pym. Anyone familiar with the comic knows that Hank Pym has been somewhat more than troubled. It’s not too much of a stretch to say that Pym’s history has been that of a pathetic, vacillating bully. Some of it has been just megaStupid (creating Ultron), but some of it has been so odious it can’t be unseen (abusing Janet). Of course, none of that happened in the MCU, but the source casts a shadow. 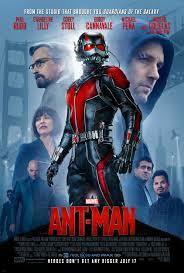 Going with the much more likable Scott Lang was a good move. Likeable Paul Rudd is really likeable. Yeah, he hasn’t got the beefcake appeal of Hemsworth. Or the snarktastic wit of Downey Jr., but spending two hours with Paul Rudd felt pretty dang good. We aren’t hip deep in mythology. I am all about the easter eggs and continuum connections — I love that stuff — but sometimes it feels like too much of a weight. Both Guardians of the Galaxy and the second Avengers succumbed to this at times (and I loved those films). It was nice to watch a film that was light not only in tone, but in backstory. But we are ankle deep! Still, clearly part of the MCU. My heart did, in fact, skip a beat when I saw Mrs. Carter standing behind Howard Stark. The sequence with the Falcon was great fun. And the projected importance of the Pym Particles to the MCU is very intriguing. Also, the breaks from canon (having Yellowjacket be a separate person) were well thought out. Great acting throughout. The main players have already been talked about and praised, but even the supporting cast is stellar. Cassie Lang could have been played for pure sentiment and “child in danger” pathos, but the kid they found is just perfect. Same with Lang’s ex-wife and the encroaching step father. All could have been doomed to tired cliche, but the performances pull it into something fresh. A good time. This is what it all amounts to. I wonder if in this age of blockbusters, we’ve lost the ability to enjoy a small film (sorry). And “enjoy” is the word, because I left the theater glowing a bit. Feeling joy. Ant-Man was a good time. Calling the “Carol Corps”! Is Captain Marvel in “real” danger?